British First Lady Samantha Cameron does what our homegrown beauties do not. 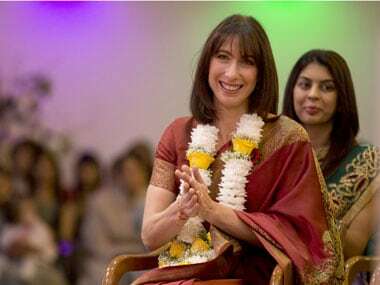 At a time when hardly any Bollywood star shows up at any function in a sari anymore, Samantha Cameron, the British First Lady, is all over the front pages of media in the UK in a burgundy Banarasi. The sari is getting more love and izzat abroad than it is at home. “Is Vidya Balan trapped in a sari?” The Times of India once asked despairingly about our only Bollywood star who routinely wears one in public. “So, the sari works well, but you can’t be endlessly seen sitting, walking and talking in one. It should be a part of your wardrobe, not the only thing in it” complained the article. Sam Cam’s sari comes like a stitch in time that saves nine yards of unraveling British-Indian relations. David Cameron’s government raised the hackles of Indians at home and abroad when his home secretary Teresa May decided to get tough on visa overstays by making an example of Indians. Her proposal for a 3,000 pound sterling bond for those deemed “high risk” visitors to the Britain got Indians worked up into a lather of indignation. It seemed a little rich coming some would say from the very country that overstayed its welcome in India and helped itself to the Koh-i-noor. Call it the Diwali un-gift. Samantha Cameron’s sari entry was a way to make sure all differences were truly ironed out and the conversation firmly changed. Of course, the British first couple’s costumed pandering didn’t go down well with all their constituents. As Amit Roy writes in The Telegraph the sari was interpreted by many newspaper readers as "the actions of ruling elite which cannot be bothered to safeguard Christian culture while seeing to ingratiate themselves with immigrants". “Pass the sick bag please! !” wrote in one reader. Another complained “I wonder if they attend their local Church?” “It does nothing to encourage integration and everything to emphasise that Britishness is a dying culture in the political class (apart from UKIP)”. UKIP is a right-wing party with hardline views on immigration. But all that abuse actually helps the Camerons especially as they get ready for an India trip on 14 November. In one fell swoop, Samantha Cameron allowed David Cameron to become an enlightened defender of multiculturalism without having to do very much. It’s quite the silken coup. David Cameron apologised for showing up at the temple in his usual boring suit. But he didn’t apologise for that ill-thought out discriminatory bond proposal. Clearly love means never having to say sorry. Only sari.